Admire a vista panorâmica de Amsterdã a partir do topo da torre de 22 andares do A'DAM (A'DAM Toren). Seu ingresso permite acesso rápido, uma visita e uma visita ao LOOKOUT, o nível mais alto da torre, onde você pode fazer um passeio no balanço mais alto da Europa (custo adicional). Passe pela borda da torre de 100 metros para uma experiência emocionante no centro da cidade. Examine a exposição interativa de última geração para saber mais sobre a cultura, a história e as tradições de Amsterdã. Encontre o caminho para a Torre A'DAM (A'DAM Toren), localizada nas margens do IJ, em frente à Estação Central. Com seu ingresso pré-contratado, passe pela fila de visitantes em espera para aproveitar seu acesso rápido. Subir para o LOOKOUT no último andar da torre para vistas panorâmicas do centro da cidade espalhar-se abaixo de você. Caminhe pela exposição interativa de última geração para saber mais sobre a rica história e cultura de Amsterdã. Para uma emoção adicional, faça um passeio no maior balanço da Europa (por conta do visitante). Segurado rapidamente em um cinto de segurança de alta tecnologia, balance-se sobre a borda da torre de 320 pés (100 metros) para uma perspectiva única e de deixar cair o estômago. Beba um coquetel no Madam, um clube panorâmico, bar e restaurante, ou aproveite as melhores vistas com o jantar no restaurante Moon giratório. Seu bilhete também inclui uma foto digital da sua visita. Very good views of the city and water ways from the roof and you could try the swings which throw you out over the edge. Ferry across the river are every 10 -15mins. Great way to get an overview of Amsterdam. Easy to get to and the 360 degree view is great. Option of swinging off the edge but passed that one up! Great tower, very modern and entertaining. The lift will not disappoint you. 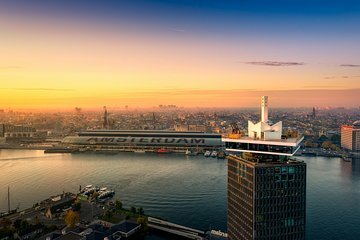 The skydeck is nice and we could enjoy a beautiful view of the city of Amsterdam. We also tried the swing, such a unique experience to swing on the top of Amsterdam. Very easy to access the tower with the free ferry. Really good experience and amazing views from the top. Well worth visiting, you get some fab views of the city and beyond. The kids did the swing and they loved it, not bad priced at Euro 5 extra. Nice and very elegant. But as a person who is visiting they should perhaps have a shuttle from the center to the ferry. I was a bit confused as to if I could stop a cab. Luckily, the driver advised me to stop one in the street not from the ferry point as they would charge me a bit more. So I walked a little further out in order to get a cab. I enjoyed the pictures, and the elevator ride. The only thing I didn't do was the swing!! I am afraid of heights hahaha. Still an awesome experience and just a free ferry ride over. Excellent way to spend a couple of hours viewing Amsterdam. Free ferry across, a fun green screen family photo experience, a fast and innovative elevator ride to the top followed by a top view of the city. Children loved the 'Europe's highest swing' experience and the parents enjoyed drinks in the bar! What an amazing experience! Started with an awesome elevator ride. The spectacular view is of the entire city and polder landscapes. We could relax on beanbags on the roofterrace, stand on the glass floor to look down and go on the swing over the edge and many more! Totally worth it!